Happy Monday Everyone! As usual I didn’t work on Friday and we didn’t have anything planned that night. Days like this are usually when I try something new for dinner, especially something that isn’t terribly unhealthy. My husband is in charge of dinner Sunday through Tuesday, because those are the days I work, and his list of dinner options is pretty short. But hey, I’ll take it because it’s soo nice not to have to worry about dinner after being at the hospital for 13+ hours! I also always try to incorporate something that James usually says he doesn’t like so I can convince him it’s not so bad. A little back story on my husband: when I met him, and really to this day, he didn’t eat any vegetables. He claims corn and potatoes, but let’s get real…those are starch and DO NOT count!! Hence, the reason I make things like this, to broaden his food horizons! I had a spaghetti squash I knew I wanted to do something with, so I went to my dear friend Pintrest to gather some ideas. I then stumbled upon This recipe. Naturally, I didn’t have all of the stuff, but I had things I could substitute to make it my own. I hope you try it out and enjoy it as much as we did! 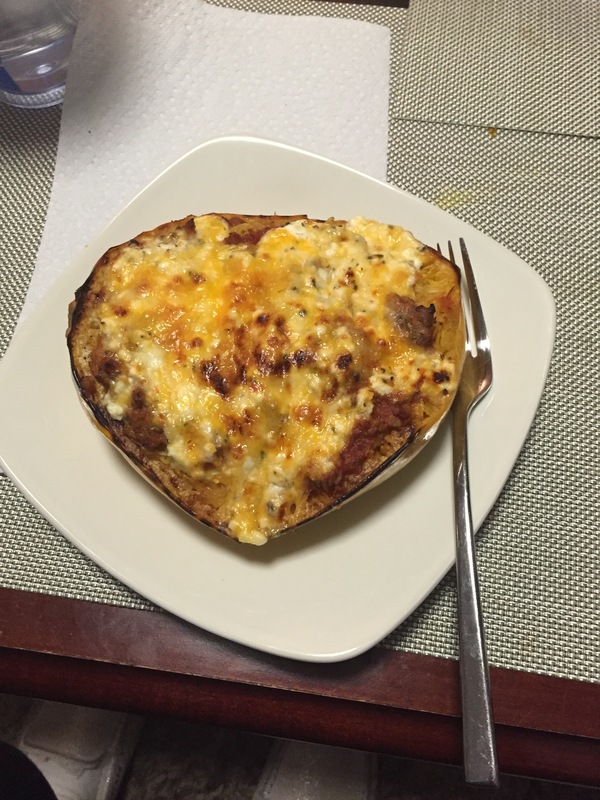 Yep that’s correct, I said WE…This was husband approved and he would eat it again!! While squash is roasting, brown Italian sausage in large skillet over medium heat. Remove sausage from the pan and set aside. If you are using a jar sauce, add that to the pan now and simmer. If you have a simple homemade recipe, that’s great, just use the sausage pan to make it so you can use all of that flavor left in the pan! Once the sauce is heated through add the sausage back in. Once squash is tender and cooled slightly (I gave my daughter a quick bath and got her ready for bed while it cooled), use a fork to remove most of the center. As you can tell from my pictures below, next time I will leave a little more inside to help the squash hold their shape! Now we layer the fillings, much like you would a lasagna! 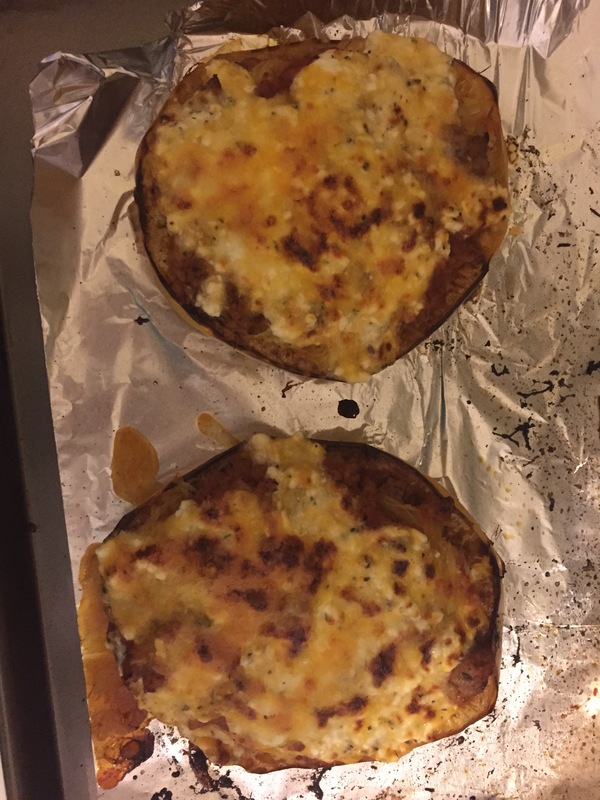 Since there is still some squash on the bottom, I started with the italian sausage sauce, then the cheese mixture, and last a layer of the noodle…then Repeat the sauce and cheese layers. End with the cheese mixture and if you want sprinkle with more cheese if you think it needs its! Once you have them put together, turn on the broiler, put them back in and wait for the cheese to bubble and brown! Yum!! Ready to dig into this deliciousness! This looks like a great dish. I rarely find spaghetti squash in my part of England (*sniff*) but I imagine it might work fine with another kind?